The Generic PC or industrial PC is a generic target (typically a general purpose or industrial PC with x86 based CPU like a PC/104 stack) without any specific Input/Output. This target can be used as template for own x86 PC-based targets. Linux supported I/O cards can be added to provide the required inputs and outputs. 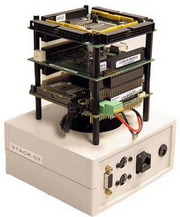 The following picture shows a PC/104 stack with some mounted boards: a FireWire extension board and a fully configurable FPGA-based digital I/O board. PC/104 with mounted add on boards. No inputs or outputs. External PC I/O board are available from many hardware providers. Prerequisite is that the I/O board can be used under Linux, Comedi or Analogy. Please contact Controllab Products B.V. for suitable hardware providers and possibilities for specific I/O wishes. By default, Controllab Products B.V. uses a small embedded Linux distribution with RTAI real-time Linux that includes the 20-sim 4C target support software. If you want to use 20-sim 4C in combination with your favorite Linux distribution or when you want to use 20-sim 4C in combination with a target running a different operating system than real-time Linux, contact Controllab Products B.V. for the available options.